They seem to spend a fair amount of time complaining about one another these days, so this moment was unexpected. Gareth was even thoughtful enough to ask Mal if the chair was being rocked too fast or too slow. 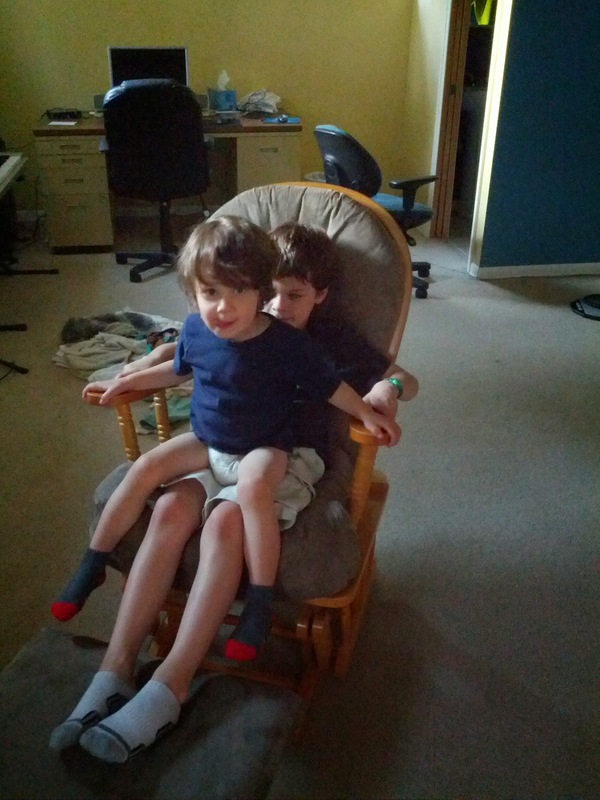 Last time for the boys to enjoy the chair as it's being picked up by another couple tomorrow. We were gifted it by our friends in Indiana who didn't want to move it across the country with them. It got a lot of use after Malcolm was born, but it's time for it to be passed on. We'd brought this table (also from our friends in Indiana!) upstairs for Gareth's birthday. In order to get it up or down the stairs we have to take off the legs. 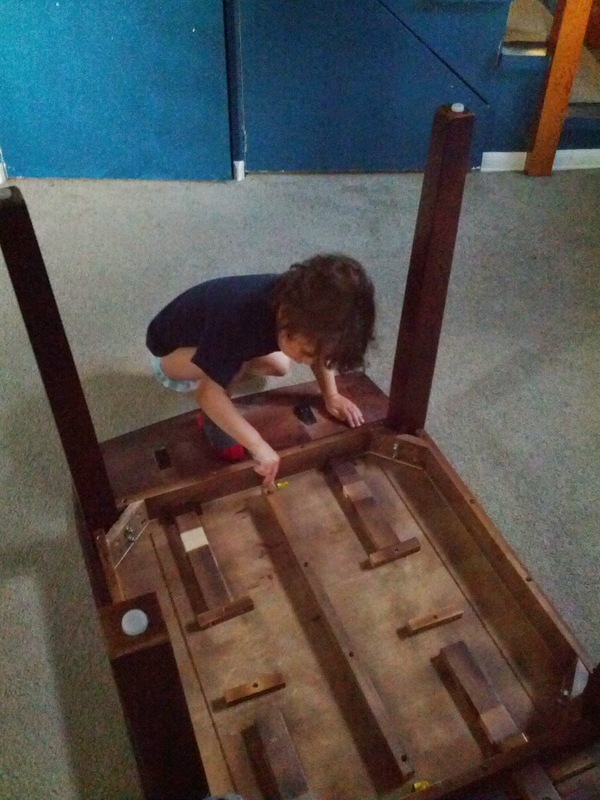 Malcolm "helped" me take it apart when we took it up, so as soon as he saw me turn it over upstairs this evening he ran off to get his tool so he could help build it again. I let him help twist some nuts on or off, and he does a good job of that. Sometimes he starts out turning it the wrong direction, but as soon as I tell him to turn the other way he's good to go. 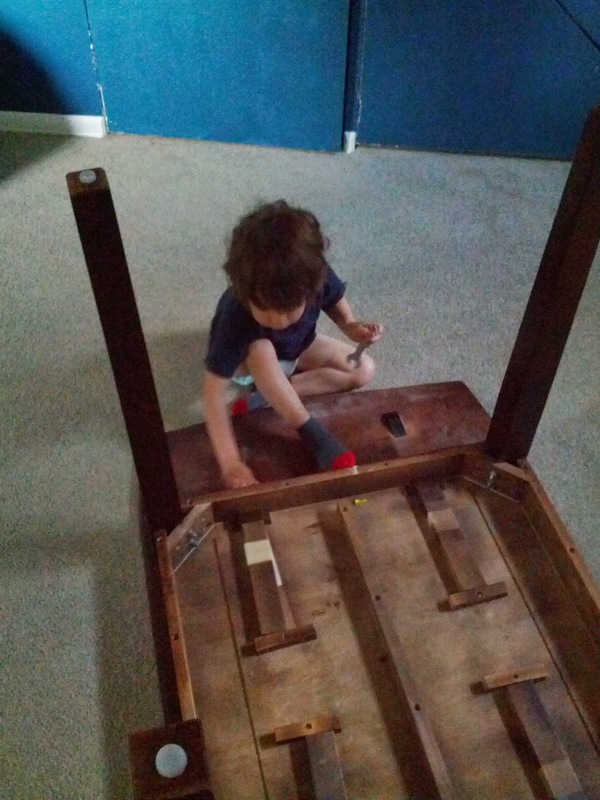 Once everything is put together he likes to pretend to build with his tool. He was so proud to have helped. Hey, I know that rocker! Glad to see it's still in good use.